Editor’s note: Today it’s my pleasure to present a guest article written by Beverly Voth. Like many other developers, I have enjoyed and benefitted from her ongoing contributions to the FileMaker community. I do a lot of text manipulation for EDI (Electronic data interchange – http://en.wikipedia.org/wiki/Electronic_data_interchange) and plain text exports with fixed-width field data. Some varieties of EDI use XML, but this article is about plain text. EDI may or may not use the fixed-width format. Fixed-width reports may or may not use delimiters and various “padding” characters. 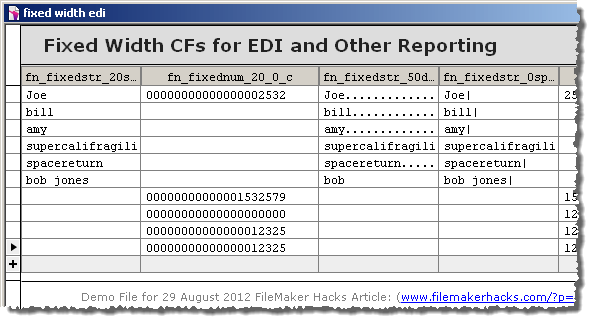 I created two FileMaker custom functions to help me calculate fixed-width and EDI text for export, and if you wish, you can follow along in today’s demo file, Fixed Width EDI. This entry was posted in Beverly Voth, General, Level: Intermediate, Macintosh, Version: FM 8 or later, Windows and tagged Custom Functions, EDI, Export, Fixed Width, Reports, Text Calculations on August 29, 2012 by beverlyvoth.